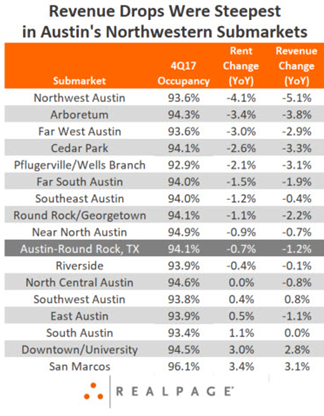 ​​​​​ AUSTIN – Apartment operators in the Texas capital metro lowered rental rates 0.7 percent in the past year. In fact, 2017 marks the metro’s first annual rent decline in more than seven years, with rents diving 2.4 percent in just the fourth quarter. ​Combined with an occupancy setback of 0.5 points to 94.1 percent, rent cuts took revenues down 1.1 percent during the past year. The most drastic revenue losses were clustered in the metro’s northwestern submarkets, where drops were driven by sharp rent declines of 2 percent or more. Austin’s 2018 supply volume is scheduled to drop to 7,292 units, 33 percent fewer units than were delivered in the past year. Still, that’s a significant supply volume, which would grow inventory 3.2 percent.